In case you haven’t noticed, EV battery technology is the new black. 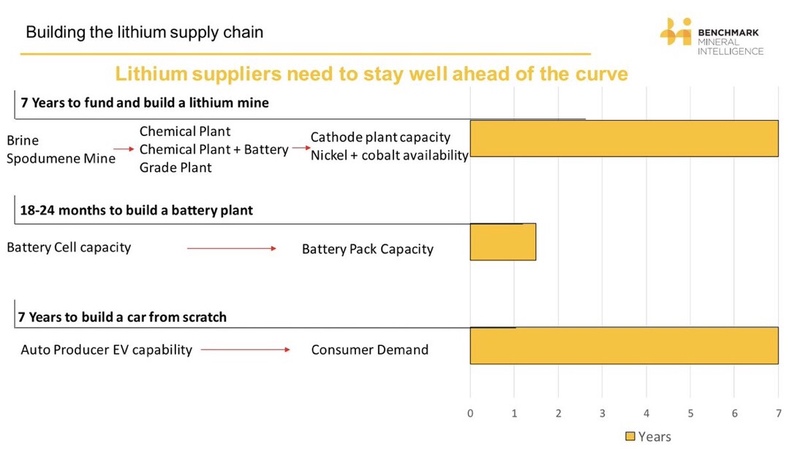 With Lithium being one of the key metals driving this technology, our friends at Benchmark Mineral Intelligence have looked at the material’s supply chain – and the time it takes to develop the respective components of it. The chart serves as a great reminder of why resource policy can’t occur in a vacuum – and why it is crucial for policy makers to think strategically and comprehensively. Thankfully, the U.S., which has long had the dubious honor of having one of the lengthiest permitting processes for mining projects among the leading mining nations, has embarked on a quest to streamline the policies hampering the responsible development of our nation’s mineral riches. As friends of ARPN know well, U.S. competitiveness and national security are at stake. According to a recent Ames Lab press release, the Institute will focus on maximizing the efficiency of processing, usage and recycling of Lithium and Cobalt starting this summer. “Other key manufacturing material supplies are in need of the Hub’s fast-moving collaborative approach. Research from National Laboratories and academic institutions is combined with engineering know-how from manufacturers, economic analyses, and assistance from AI and machine learning to rapidly find solutions to domestic shortages of manufacturing materials. In its research efforts, CMI relies on collaboration with academia as well as the private sector – an approach that has already yielded some great breakthroughs, several of which we have featured in our “Materials Science Profiles of Progress” series on the ARPN blog. 2018 – A Tipping Point For U.S. Resource Policy and Related Industries? Senate Energy Committee Zeroes in on Energy Storage Revolution – Where Will the Battery Megafactories Get the Minerals and Metals They Need?